This Sauerkraut Cranberry Apple Salad is super healthy and supports your gut health. I love fermented foods and believe its an important aspect of our diet. Fermented foods, like sauerkraut and atjar, are rich in enzymes and healthy bacteria that support digestive health. Our digestive system is at the core of our being and the foundation of our health. We cannot be healthy and have strong immune system if we don’t have healthy well-functioning gut flora. Very often our contemporary diets are high in processed foods and lack these essential beneficial bacteria. That’s why including fermented foods in our diet like sauerkraut, chutneys, relishes or kimchi are important. This fermentation process of vegetables allows for the proliferation of lactobacilli. These healthy micro-flora are naturally present in vegetables and in our digestive tract. They help break down the sugars and starches found in the vegetables, aiding in proper digestion and elimination. 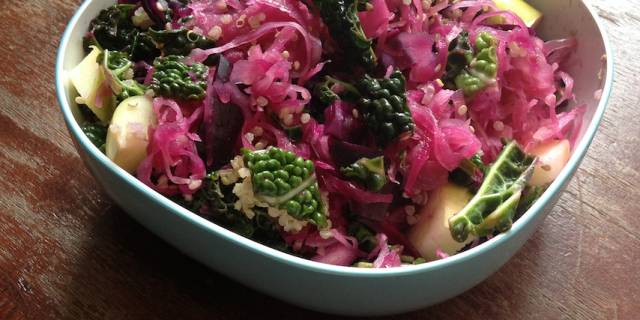 Fermented vegetables are best eaten raw. Heating will destroy the lactobacilli and healthy enzymes. You can ferment your own foods but it takes time. This salad is a quick healthy version. I like to prepare it 1 to 3 days in advance allowing the vegetables to soften and the flavors come out more. It gets better each day but you can also eat it right away. In a large saucepan add the sauerkraut including its juice. Add the chopped green cabbage and red cabbage. Mix in sea salt and the vinegar and stir well. Cover with a lid and let sit in the refrigerator. It will keep well for a few days. Rinse quinoa well using a fine sieve. Cook for 8 minutes and allow to cool. You want to the quinoa to still have a bite (al dente). When cooled down, season with 1 tbsp of olive oil and pepper and salt. In large salad bowl mix the cabbage, the quinoa, sesame seeds, cranberries and apple. The apple and cranberries add some sweetness but if you like more you can add honey or agave to taste.